Has anyone else found a use for a dog product other than for what it was originally intended? It’s probably not always a good idea, safety-wise, but in some instances I am sure a little creativity goes a long way. 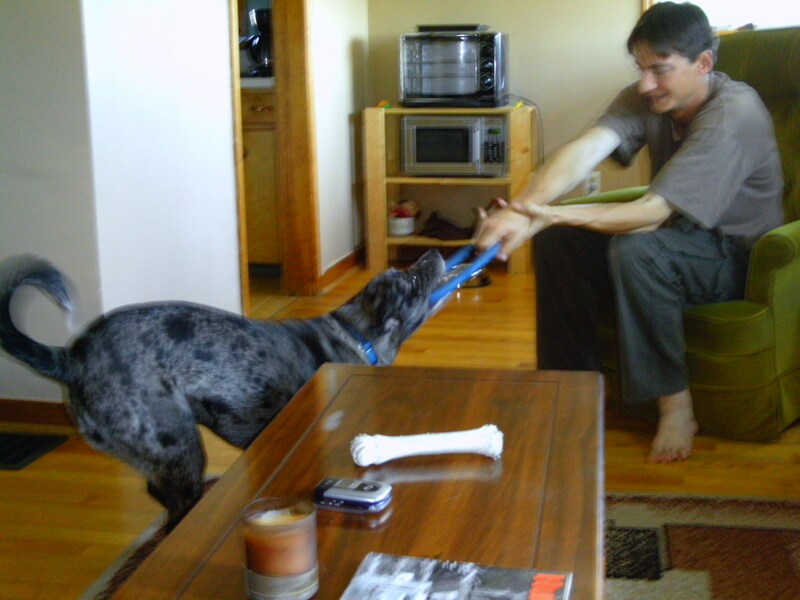 Shiva’s reluctance to play tug in public is widely known. In agility, tug is the preferred method of reward. Many agility coaches demand tug drive and if you don’t have it, they won’t work with you. Fortunately, we have lucked out and our trainer is a bit more understanding. Okay, a lot more. Because Shiva is not interested in tugging when there is food around, we have had to be creative in finding ways to reinforce her during class. It is possible to just use treats, but ideally the rewards are thrown out a head of the dog. It helps them focus on moving forward down their line. If the dog is constantly coming back to his handler for a reward, he won’t be looking at the next obstacle. When you throw the reward ahead, it encourages the dog to keep going. Speed is just as important as accuracy. Treats are hard to use in this way as they often can be hard for the dog to see, especially if you are training on grass. It is also believed that treats aren’t as good at creating drive or intensity. Tugging on a toy helps rev the dog up, which is usually what agility handlers want. A revved dog is a fast dog. Unless this is your first time reading the blog, you’ll know we don’t have issues with that. In fact, as a rule, I never, ever rev Shiva up. I am not that masochistic. Anyway, in the two years we’ve been practicing the sport we have used every method we know to try to get Shiva tugging in class. We have used tug toys with food pouches, we have used giant grocery bags filled with treats, we have used ropes soaked in chicken broth. Nothing worked. Eventually I just gave up and started letting her tug on the pouch I used to hold extra treats. Within minutes, she was a tugging machine! Now, all I have to do is pull out an object that remotely resembles a treat pouch, even an empty one, and she is springing around the room. It may not be the original use for such a product but it works for us. And it works very well. Understandably, we go through a lot of these objects. They are not exactly built for durability; Shiva’s teeth aren’t exactly soft. As soon as she creates the first hole, her drive for the pouch intensifies. She knows it’s only a matter of time before the entire thing is destroyed and she loves to help it along. After much trial and error, we have finally found the best treat pouch on the market for our purposes. The Treat Tote by Canine Hardware, the same people who make the Chuckit toys, is by far the best treat pouch for tugging. The material is easy to clean and durable. There are two layers and the inside layer is where the actual treats are stored. Shiva can rip the outside as much as she pleases but she won’t get the goodies inside. I also like how the string ties around the middle as opposed to the outside rim. One of the biggest problems with “pouch-tugging” is that a few good yanks often renders the string utterly unusable. Without a way to close the pouch, chicken pieces fly everywhere – much to the delight of the other dogs in class. The string on the Treat Tote is thick and is located on the inner layer. No matter how much she tugs, Shiva can’t break it. No doubt it annoys her. This pouch also features a handy clip for your belt. Of course, I wouldn’t use it for something so smundane. Instead, I find this clip is incredibly useful for attaching a leash. Due to Shiva’s tendencies to “take the money and run”, I prevent her zoomies by clipping a leash to the pouch. I hold on to one end whole tossing the pouch out ahead on her line. If she goes to run away with her prize, she will find me following right behind, foiling her nefarious plans. It may not be what the pouch was designed for yet the Treat Tote handles the job with ease. As Shiva never has access to such a huge reward when alone – in her dreams – I don’t worry too much about the potential safety risks. I am still curious, though. Have you ever re-purposed any of your dog’s belongings? Is there a new use for a water bowl that I haven’t heard before? Whatever works, I say. I don’t want to know what your treat bag bills are, though. Sounds like a smart idea to me!!! Definitely have to be creative! I’m sure you have tried, but they may great “jackpot” toys that you can stuff with food and still tug. I have to use these with rio because he’s so ball driven but isn’t so much into tugging during agility… it’s either the ball or food. Haha, I love this! Way to be creative. Whatever works, right? Never Say Never uses containers filled with food at the end of each obstacle with her greys. The dog does the obstacle, click, goes straight forward to the container of food. I would imagine it would take a bit of time acclimating the dog to not turn toward you but ahead to the target container, but it’s certainly one way to use food as a driving reward. Never Say Never Greyhounds, I mean. Wow – that was a great idea to get her to tug. Nice! That’s awesome! I think it’s a great idea. I’m glad it works for you. I can’t think of any dog products I’ve ended up using differently than they were intended. However, I can think of quite a few non dog products that ended up as dog toys! As long as it works, I say it’s all good! It’s awesome that you found a way to get her to tug – it doesn’t matter what the item was made for as long as it works! Nice work 🙂 I can just picture Shiva getting all excited about ripping apart the treat bag!! Soaking a rope toy in chicken broth? You *are* a dedicated dog trainer!! I just have to say wow about the treat bag! It’s one tough ombre to stand up to Miss Shiva! Heh heh! I love that you’re reviewing a treat bag as a tug toy. Whatever works!